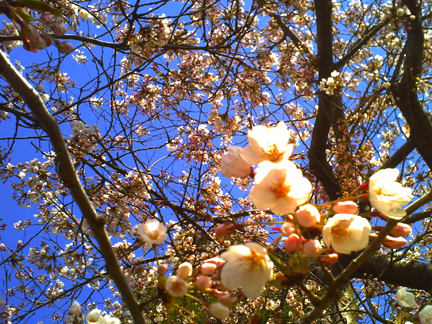 I vote cherry blossom season to be the most magical time of the year. 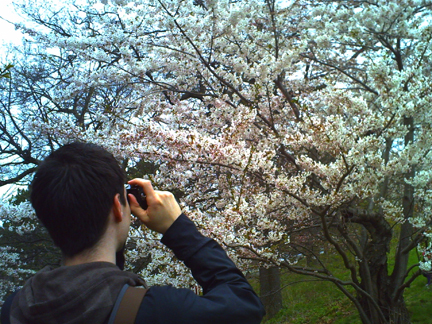 We’ve only started going to High Park to see the cherry blossoms in the last couple of years (having lived in Toronto for some 13 years now, why I didn’t start going before last year is beyond me), but we so look forward to it every spring. I’m sure lots of people do too — there was already a sizable crowd in the early morning. 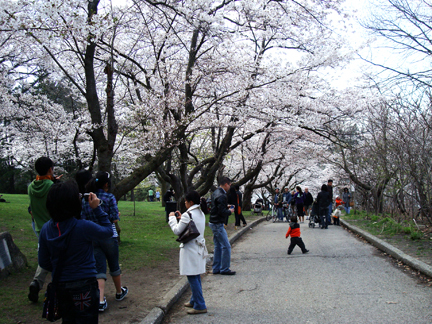 High Park organizes a cherry blossom walk every year, but I don’t think there’s an official festival for the cherry blossoms in Toronto. 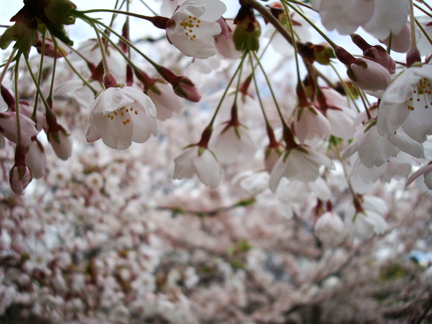 But I call it a festival anyway — it’s such a lovely celebration of spring’s arrival, and the cherry trees themselves represent a wonderful piece of history as well. 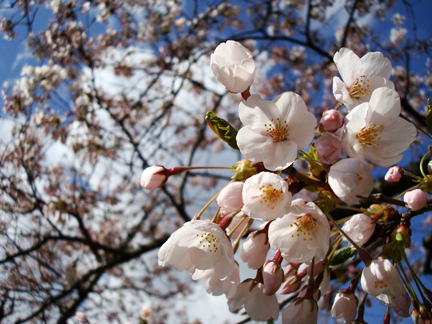 The trees were donated to High Park in 1959 by the City of Tokyo, in appreciation of Toronto accepting relocated Japanese‐Canadians after the 2nd World War. 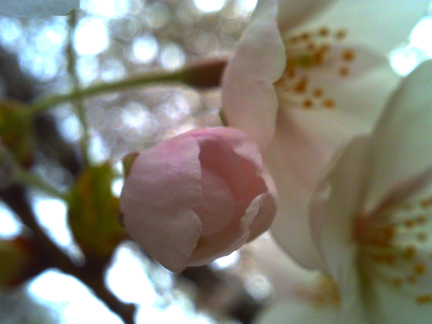 Here’s Zumi’s take on a flower bud. I really like what this photo captured — the sparkling light, the soft and delicate petals, the subtle shade of pink before full bloom to white. This really has nothing to do with the cherry blossom, but I just wanted to show you this taro brick toast I had, when we stopped for a snack after the park. 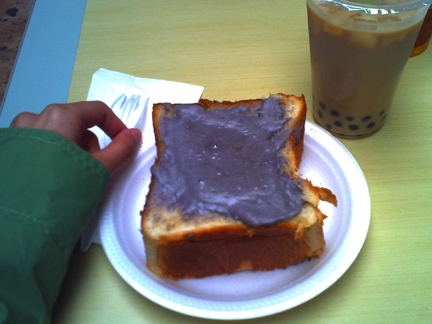 I’ve had green tea brick toast, and condensed milk brick toast, but never taro (brick toast is a Taiwanese snack made with a really thick piece of toast, with butter and various toppings). I was intrigued. It was so purple! 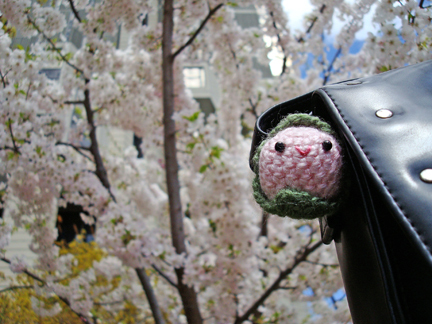 My only regret of the day was that I forgot to bring Sakura Mochi with me :( So I hung it on my purse the next day when we went out to church. 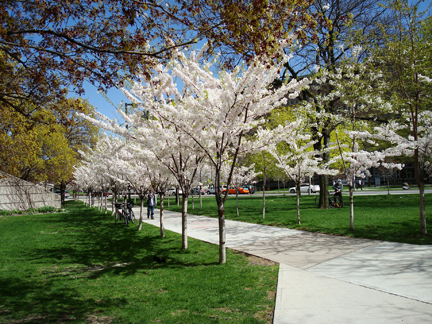 These trees are part of the Sakura Project, gifted by the Consulate General of Japan in Toronto as a symbol of friendship and goodwill. 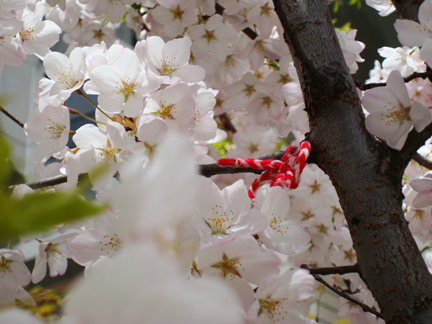 While taking yet more photos of cherry blossoms (don’t worry, I’ll just keep them to myself rather than dumping them all here :P) I spotted this red and white cord tied to a branch. It’s something that I have seen several times last spring, here, and here. So that made me really curious, and I did some digging (i.e. Googling). 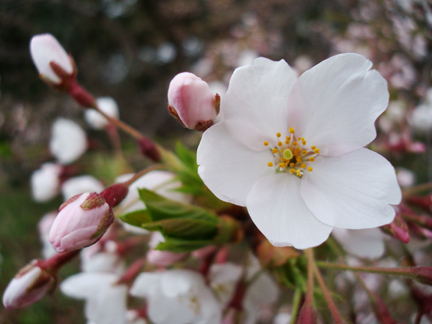 I’ve always thought that it has to do with a Japanese tradition, because of the red and white colours. But am I ever wrong! The red and white cords are part of a Romanian tradition, Mărțișor, meaning “little March”, and celebrated on March 1st for the arrival of spring. The cords have a really poetic meaning: the white symbolizes winter, and the red represents spring, fire, blood — the symbol of life; the entwined cord therefore symbolizes the passing and coming of the seasons, the continuous cycle of nature. 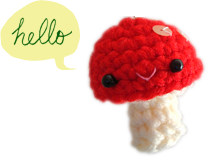 The red and white cords are worn as pins and then tied to the branches when the trees begin to bloom. I hope you’re enjoying some lovely spring weather like we do here!